Johnny Carinos Pigeon Forge was an easy choice for Italian cuisine! Before leaving home, we did some research and made a list of what appeared to be the best places to eat. 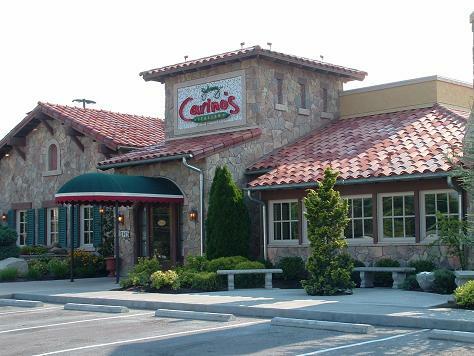 We read reviews and recommendations of many restaurants with Carino’s Italian Grill coming up one of the winners! One of our friends in the group was ethnicly Italian and with a name like “Lombardi”, we figured she’d want to dine Italian at least once on the trip! So, we had a contest to see who could travel for a week using the least amount of luggage space. Well, Kelly won the challenge and so we decided that she could pick the “restaurant of choice”, on the first night. It turned out we were all winners that night because she chose Carinos Italian Grill. Oh, and by the way, she managed to pack a week’s worth of clothes in a very small duffle bag, yes, one bag! The atmosphere at Johnny Carinos Pigeon Forge is classic Italian. It’s not showy, but rather a very casual, family dining experience. We were seated in a cozy room just off to the right of the front entrance. The room was very well decorated, had nice big wooden tables and comfortable chairs. The grill at Carino’s is wide open so you can see everything going on in the kitchen. They also had a very nice bar area that was somewhat private from the rest of the restaurant. It was all very comfortable and when our food came, we quickly realized we were indeed going to have enough for leftovers! First the waiter brought us a loaf of fresh baked Italian bread and some olive oil for dipping. I had the stuffed roasted veggie rigatoni and I kept praising the chef all through my meal. You see, I usually order menu items I know I won’t make at home because they seem too labor intensive. This sauce was out of this world and the dish was superb. For me, the best Italian I’ve ever ordered out. Steve had the classic spaghetti and meatballs which was delicious and had just the right unique spicy kick. Josh ordered the six cheese tortellini and it was rich and flavorful. Kelly’s baked lasagna was a lasagna to be reckoned with! Portions are more than generous and to top that, the food was absolutely delicious at a reasonable price. I wish I could get some of their recipes! I was hoping to get back home and find that they would be opening a Carino’s someplace in the vicinity, but no such luck. Right now, they are located in thirty plus states! We hope you enjoy your dining experience at Johnny Carinos Pigeon Forge as much as we did.